Thomas Holland, afterwards 1st Earl of Kent, was one of the founder knights of the Most Noble Order of the Garter. Born around 1314, he fought many times in France during the Hundred Years War, including at the Battle of Sluys and the Siege of Tournai, and was in chief command of the vanguard at the battle of Crécy under the Black Prince. His military achievements meant that he was given important commands including the Captaincy of Calais Castle, guardianship of the Duke of Brittany during his minority, and in September 1360 his most important post yet, that of Edward III’s Captain and Lieutenant in Normandy and France. In 1340 he had secretly married Edward III’s cousin Joan, the “Fair Maid of Kent”. While he was away fighting, she was forced by her family to marry the better connected William Montagu, Earl of Salisbury. On Thomas’ return, the first marriage was revealed, and the Pope ordered Joan to return to Thomas. This she did, and they had four children together. In 1361, after Thomas’ death, Joan married the Black Prince, and gave birth to a son who would become Richard II. This image comes from a notebook by Henry Emlyn, architect and supervisor of George III’s restoration of the Chapel [SGC M.172]. 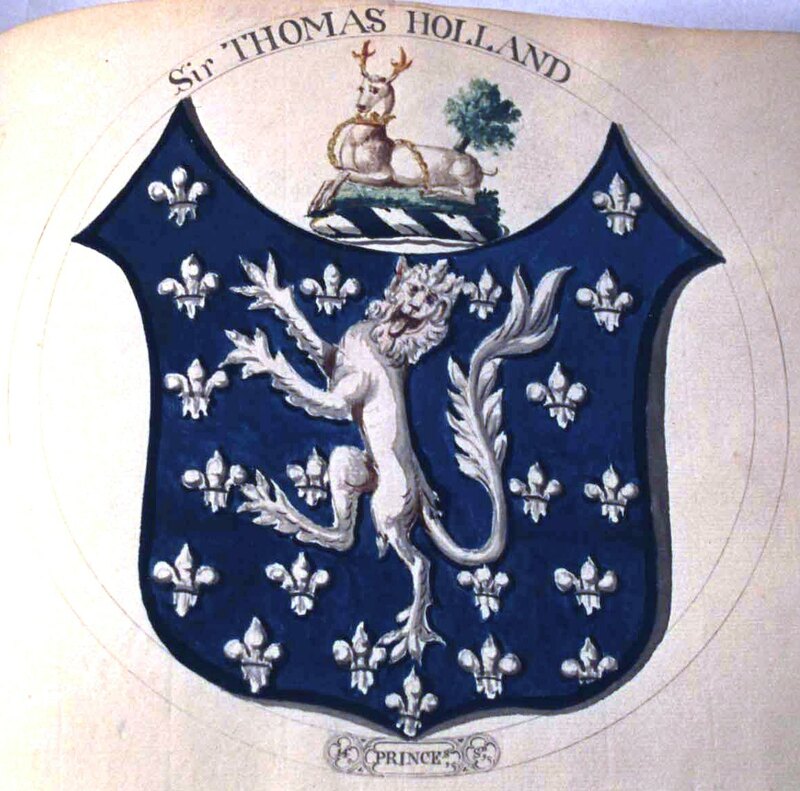 Dating from around 1785, this page shows the arms of the Holland family, azure powdered with fleur-de-lis and a lion rampant argent. The crest of the hart lodged, or lying down, and ducally gorged comes from the arms of Joan of Kent.